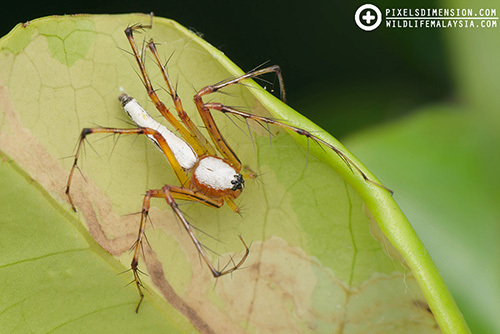 Comb-Footed Spiders are generally small spiders that come in a wide array of bizarre shapes and colours, but almost all of them have comb-like bristles on their 4th pair of legs. Their small sizes and unique habitats means that they are often overlooked by people. Also known as cobweb spiders, not all Comb-Footed Spiders build webs though, some prefer stealing food from other spiders, whereas some prefer to live on single-thread lines, or none at all! 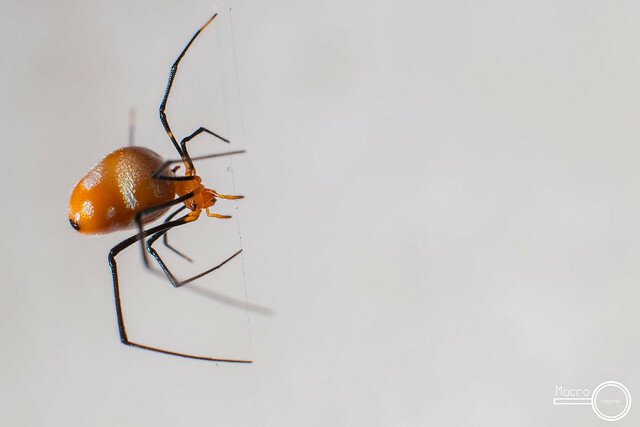 The notorious Black Widow and Redback Spiders (fortunately not available in Malaysia), are also classified under the family Theridiidae. #1. 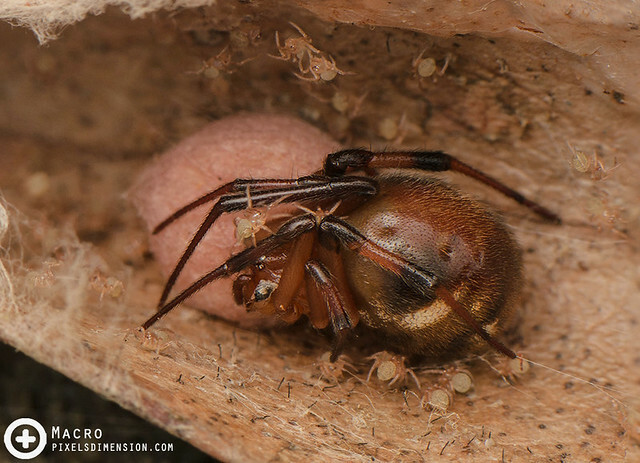 A mother Parasteatoda mundula, egg sac and spiderlings. Probably the most common Theridiidae spider in Malaysia, Rolled-Leaf Comb-Footed Spiders love to live inside a rolled leaf suspended at the centre of the web. The female spider will often be found within the leaf, with pink-to-yellowish, egg “balls”~ The mother spider in this photo has just finished making another pink-coloured egg sac, indicated by the shrunken state of the abdomen. The spiderlings around her are likely from a previous egg sac. These tiny spiders will stay under the care of their mother until they are big enough to leave. #2. A female Red Silver Food Stealer (Argyrodes flavescens). This sneaky spiders prefers to stay on webs of larger orb-weaver spiders e.g. Nephila, Nephilengys and Argiope etc. to steal the food from there. Most of the hosts do not mind their presence possibly because they are so small. 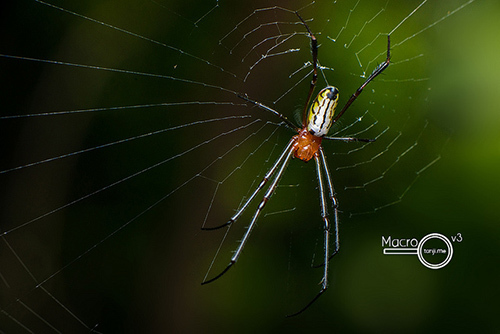 #.3 A Mangrove Whip Spider (Ariamnes sp.). 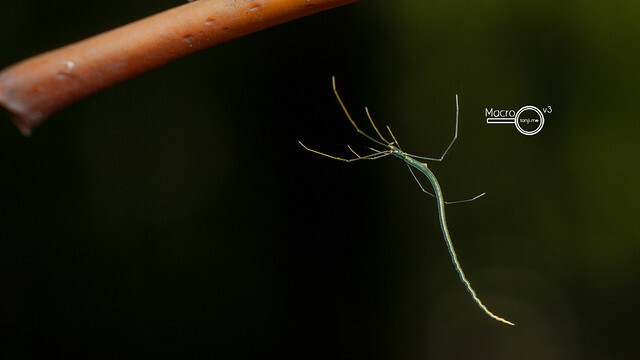 This weird-looking spider has an abdomen shaped like a whip- hence the name. These spiders can often be found with few strings of silk connecting one or two leaves which they rely on to capture preys. The whip-like “tail” are invaluable in helping the spider to camouflage. #4. A mother Comb-footed spider (cf. Anelosimus sp.) with spiderlings. Found this caring mother in the mangrove. 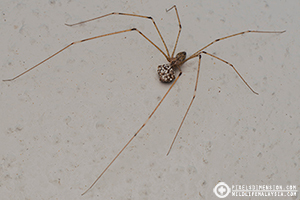 Mother care in arachnids is not uncommon as it helps increases the odds of survival for the hatchlings. #5. A female Zebra Smiley (Theridion zebrinum) with Signal fly prey. A comb-footed spider enjoying her large-sized meal. 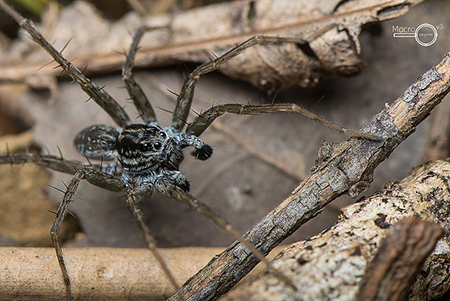 This fancy-looking spider has a “smiley face” at the tip of its abdomen, which is pretty amazing! 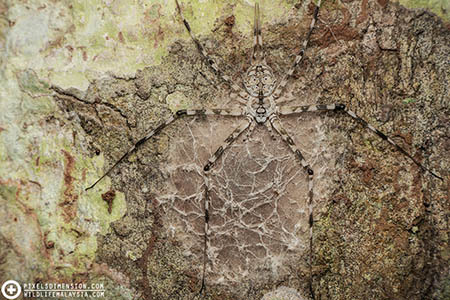 On top of that, the Zebra Smiley builds unique, zig-zag webs which are somewhat parallel across the broad surface of a leaf. ** Identification of the subjects in this page are tentative and should be taken with a pinch of salt.